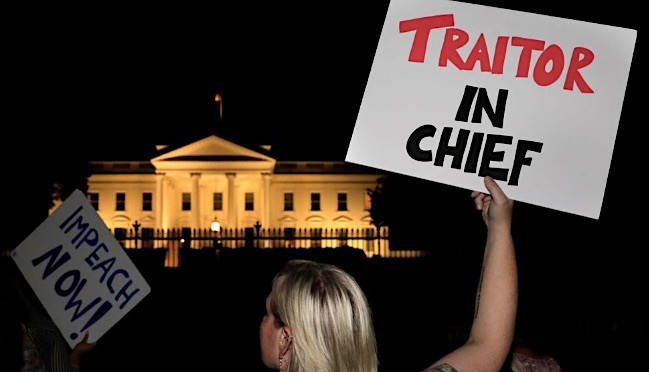 SOMETHING’S IN the air: In the last few weeks, protest of the policies of President* Trump has lately soared to, uh, new heights. First, of course, there was the Trump baby balloon, which famously floated over London’s Parliament Square and its environs during his visit to the UK earlier this month. 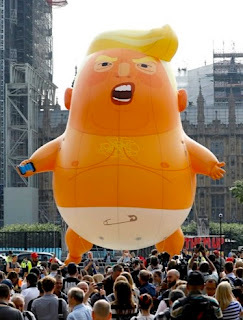 It was classic passive protest — a 20-foot-tall balloon whose cartoon aspect perfectly suited its subject: a bloated Trump in his orange glory, sporting a diaper, mouth in customarily unhappy position, the U.S. maximum leader clutching a cellphone in one short-fingered hand. It captured the world’s fancy. 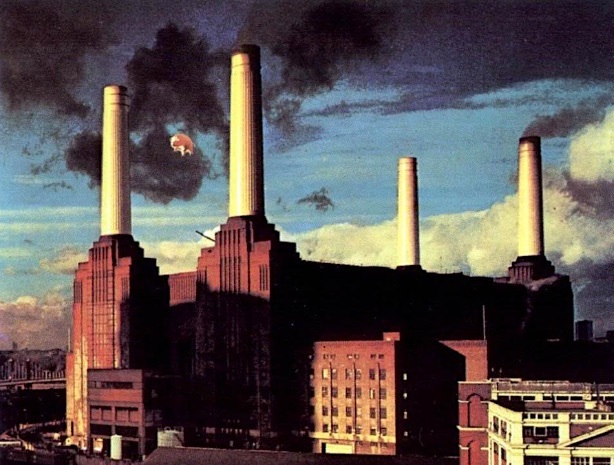 There hadn’t been so much attention paid to a balloon over England since Pink Floyd sent an inflatable pig aloft in 1976, with that critter floating over Battersea Power Station while being photographed for the cover of the Floyd’s Animals album — a record that brilliantly invoked Orwell’s Animal Farm to make pointed commentary about social injustice and power in pre-Thatcherite England. The Trump baby stunt was followed by another on this side of the Atlantic. 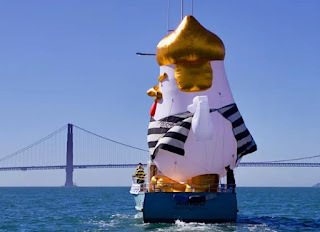 In San Francisco on July 22, some inventive balloon aficionados re-launched another Trump balloon, this one depicting The Donald as a chicken in prison stripes. That balloon, 33 feet high, sailed serenely around San Francisco Bay, making appearances at Fisherman’s Wharf, the Ferry Building, and McCovey Cove, Curbed SF reported. The Trump chicken, a fixture of protests in the area since April 2017, was last seen fittingly circling Alcatraz early this year. More airborne antics are yet to come. There are plans afoot aloft to bring the UK Trump blimp to the United States. CNN reported on July 17 that a group of New Jersey activists plan to bring copies of the Baby Trump balloon to fly near the Trump National Golf Club in Bedminster, N.J., where Trump spends summer weekends, and elsewhere around the country. A GoFundMe page was launched to cover expenses. By July 17th, about $17,000 had been raised, more than three times the original funding target of $4,500, CNN reported. They’re no longer accepting donations, but at this writing, they’ve amassed about $23,700. Image credits: Baby Trump: GoFundMe. Animals cover: © 1977 Columbia Records/Pink Floyd. Trump chicken: CDEL Family. JAMELLE BOUIE, in an essay in Slate on July 22, deftly explores particulars of the deeply feared panoramic Republican base, and finds it may not be the boogeyman that Democrats are fearing and Republicans are counting on. The monster we’ve been told is hiding under the bed may not be as fearsome as advertised. And digging further, it's possible to see that the identity of the Republican base is such a shifting sand that its value as a weapon against Democrats may be marginal or even illusory — not least of all because of the volatile nature of our electoral politics. You can see why many variables should keep you from relying on any single facet of political identity. Party self-identification — an emotional connection to a party — is one thing, party registration — an official connection to a party — may well be another. And then there’s the vote itself — the actual connection to a party. In an unusual election like 2016’s, this created a challenge to clearly identifying who and what the Republican base is. Then as now, people can self-identify with one party, register with that party (or another one) and then actually pull the lever — in a way that may be in lockstep with that party. Or not. That’s a decision arrived at in the privacy of the voting booth. And that reliably unpredictable human factor, played out in 2016, is what makes our current fears of (or confidence in) The Base so irrational. And probably wrong. Even the GOP base as broadly sketched in November 2016 wasn’t responsible for putting Donald Trump over the top. 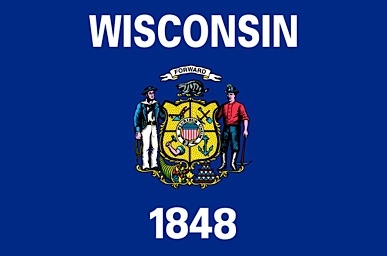 When all was said and done, the 2016 presidential election came down to three states: Trump won Michigan by 0.2, Pennsylvania by 0.7 and Wisconsin by 0.8 percentage points — in raw vote, by 10,704, 46,765 and 22,177 votes, respectively. Those 89,646 votes hardly constituted a groundswell of fellow feeling for the Republican candidate, and they can hardly be seen as the vanguard, or even the representative, of a broad Republican base. There’s not much there there to extrapolate nationally. Especially compared to the 2.8 million more votes Hillary Clinton had over Trump in the final national count. IF NOT for that literal handful of states, the crazy-quilt electoral map, the power of gerrymandering, and the machinations of the Electoral College, Trump wouldn’t have won. All to say that, as a demon in the closet to Democrats and independents, The Base may not exist as it’s been conjured in recent months. Insofar as there’s a solid, unchanging, Pantone-red core of conservatives, it’s necessary to understand that the base as now identified was created long before the GOP’s current travails. Well before the current White House took power. A lot of people have mightily convinced themselves that these voters will deliver a message about their belief and faith in Trump this November. They’re wrong. The election this November won’t be a referendum on Trump’s performance; that’s not until 2020. This coming election won’t even be much of a referendum on Trump’s legislative agenda — there’s too precious little of that agenda in the first place. November’s election will be a referendum on the performance on the lawmakers seeking re-election — most of whom were in office, doing the people’s work, well before Trump even got to Washington — or first-time candidates hoping to give voters a better, fuller sense of Republicanism than Trump can. It’ll be less of a referendum on Trump per se than an assessment of voters’ willingness to elect or re-elect lawmakers willing to march off a cliff with the Republican Party that’s enabling him. One problem with the Republican base is that it derives its identity so aggressively, so assiduously, from what it is not. It is not, as a rule, a body as culturally inclusive, as demographically pluralistic as the core of Democratic voters, and that’s something Republican voters seem perfectly happy about. Which is, or will be, a shame. 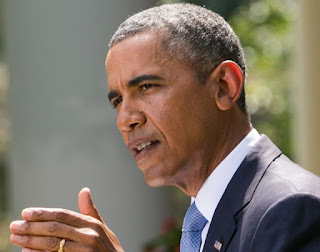 In 2012, Barack Obama won re-election with just 39 percent of white voters; he defeated Mitt Romney with 93 percent of African American support, 71 percent of Latino voters, 73 percent of Asian American voters, 60 percent of the voters under 30, and 55 percent of women. This combination was one that, for the second time in as many election cycles, captured the White House without a majority of the white vote. However big the white vote may be within the storied Republican base, its size relative to the overall national population is greatly diluted. If what happened in 2012 holds to 2020, one party attaining the majority of the white vote may be even less necessary than it was before. Sooner or later, if the GOP base’s voting patterns aren’t transferable to that wider national population, the Republican Party is in trouble — regardless of how monolithic its leaders believe the base is. AND THANKS to the Trump White House and its enablers, widening that base appreciably isn’t much of an option. They’ve seen to that. 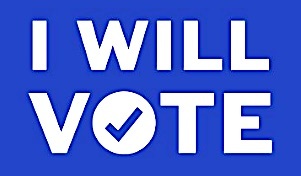 Latinx voters? Not likely; look to the House Trump immigration policy of tearing apart migrant families, overwhelmingly of Mexican or Central American heritage, in the name of national security. Unless the Republican base tries to reach this and other cohorts of an evolving America, the GOP is doomed to circle its own wagons in a tighter and tighter circle, preaching its gospel to a smaller and smaller congregation with every election cycle. These troubles for the Republican base didn’t just happen. Bouie borrows from Pew Research Center data (released in March) parsing party identification trends over 25 years, from 1992 to 2017. He cites Pew data that shows Republican Party identification fell 3 points, to 26 percent, from 2016 to the end of 2017. 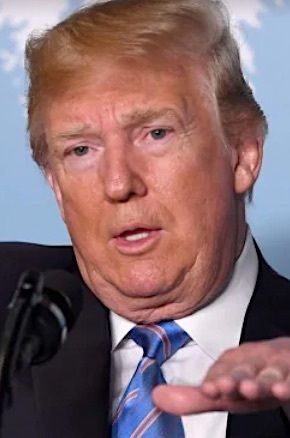 He also cites Gallup survey data showing a 5-point drop in those who called themselves Republicans, from 42 percent to 37 percent, between November 2016 and November 2017. But that’s low-hanging fruit, the direct result of the antics of the Trump administration. What’s more telling are the numbers from earlier years. The same trove of Pew data shows Republican self-identification dipped to 26 percent in 2009, then climbed higher, but never surpassed Democratic numbers from then on. And Gallup data shows that Democrats have consistently eaten Republicans’ lunch on party affiliation going back to at least September 2008. That’s where the real story of the Republican base lies: in a wider, more historically-driven overview, an overview that proves the stasis and decline of the GOP base didn’t begin with the Trump White House — and likely won’t end there either. THE REPUBLICAN base may not even be able to count on holding on to the people it's got. Whether their adherents admit it or not, some parts of the Republican base feel co-opted, disappointed, disenchanted by certain Trump policies since January 2017. Policies like Trump’s aggressive pursuit of trade tariffs, which will deeply affect businesses large and small around the country. Like the workers at the Carrier furnace plant in Indianapolis, Indiana. During the 2016 campaign, Carrier's workforce was assured by candidate Trump that he’d fight to keep their jobs in the United States. Many of them voted for Trump, believing he’d do just that. The reality? 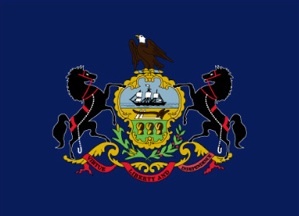 Not so reassuring; the Carrier plant went through three rounds of layoffs; the second, in January, saw the loss of 215 jobs. Many of the positions were outsourced to Monterey, Mexico. “We took him serious because he did seem to be an entrepreneur,” said Renee Elliott, ex-Carrier employee, to Charles Bethea of The New Yorker in January. THE METAPHOR of “dipping a toe in the water” is a bane of political discourse, invoked forever to describe a prospective candidate’s consideration of a run for the White House. Less attention’s paid to that rare politician who dips that toe in the moist shoreline before the water even gets there. We may be seeing that with Mitt Romney, the biggest loser of the 2012 presidential contest. We’re more than two years out from the 2020 derby, but it may soon be time to welcome back an old favorite, hopefully smarter than he was before. In ways both predictable and less predictable, the former Massachusetts governor and prime mover of the Salt Lake City Olympics seems to be slyly entering the 2020 conversation before it’s really even started. But certain statements of his own beg the question of what he’d bring to the table that’s any different from the people there now. He’s of course taken the customary route back into the national debate by way of op-ed commentary. 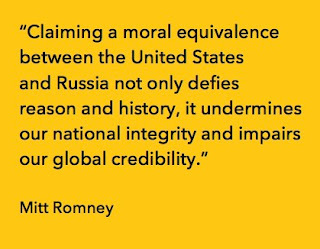 Since January 2017, Romney has shrewdly picked his spots, weighing in on various actions and statements by President* Trump, and seizing other opportunities in their own right. 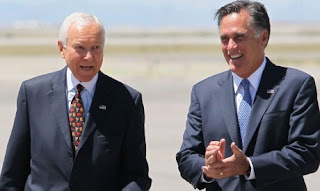 In January, Romney offered fulsome praise to Orrin Hatch, the Republican lion of the Senate who announced his retirement that month. “I join the people of Utah in thanking my friend, Senator Orrin Hatch for his more than forty years of service to our great state and nation. There was another reason for Romney’s hosannahs for Hatch. Romney threw his hat in the ring for the Utah primary election in June, seeking to replace Hatch in the Senate. 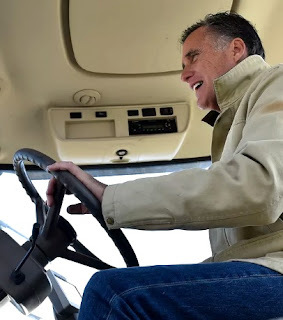 ROMNEY’S SPOKEN his mind about House Trump, cherry-picking through the policies and practices of the White House, and apparently rejoicing when he’s not in lockstep with The Donald, and otherwise exhibiting some measure of dependent independence. In the early going, he’s been nobody’s poodle. 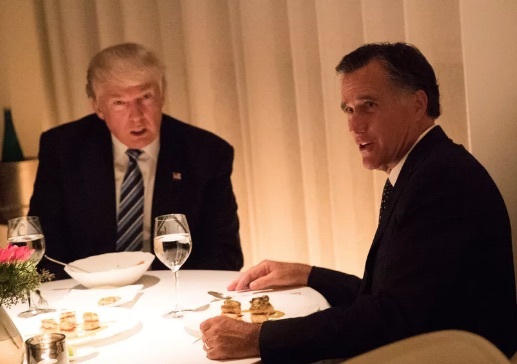 “I will support the president’s policies when I believe they are in the best interest of Utah and the nation,” Romney writes in the June 24 Salt Lake Tribune. And Romney used a familiar metaphor in his own campaign pledge: “I will call them like I see them.” On June 27, Romney won that Utah primary. He’s the odds-on favorite to win Hatch’s Senate seat this November. I F DIRECTOR of National Intelligence Dan Coats gets fired in the near future — paying the price for a perfectly normal reaction to a disruption in a workplace chain of command — we can save time and energy by not being flummoxed, or even stymied. President* Trump’s done this kind of thing before. As with the departures of Reince Priebus and Rex Tillerson, two once-solid pillars of House Trump, Coats’ possible departure signals a kind of Trumpian return to form. If past is prologue, look for Trump to further cut Coats out of the loop, in a fashion consistent with past practice. 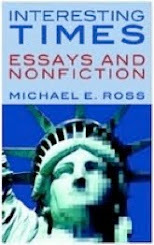 Thanks to even a shallow reading of American political history in Trump time, we needn’t be surprised. The viral particles of Trump Enragement Syndrome are in the air again. Remember how Priebus got his walking papers? 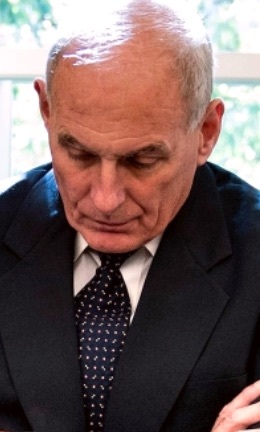 After months of being in the White House wilderness — ignored by staffers, made to be the 12th man on the team, treated like the leper intern instead of the White House chief of staff — Priebus was replaced in July 2017 by John Kelly, formerly the head of Homeland Security. 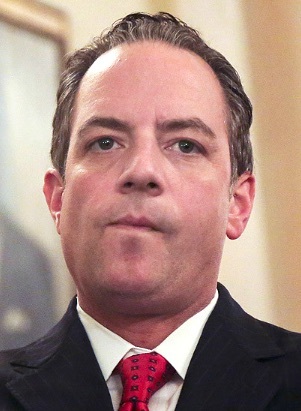 Politico reported last July 28, the day Priebus resigned as White House chief of staff: “From the start, Priebus — whose presence was intended to give the Establishment wing of the Republican Party a line into the White House, and to smooth Trump’s relations with House Speaker Paul Ryan and other GOP leaders on Capitol Hill—was hemmed in, with senior advisers like Bannon, Trump son-in-law Jared Kushner and Kellyanne Conway reporting directly to the president. 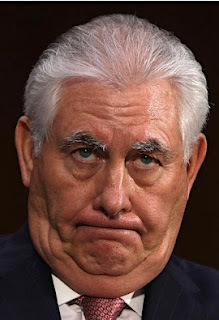 AND WE can’t forget Rex Tillerson, the former CEO of Exxon Mobil and secretary of state. Weeks of backbiting and recrimination preceded his exit, time spent in a quiet kind of tension with Trump. Tillerson’s attempts to exercise some degree of autonomy, of standing on the not-inconsiderable power of its authority (an office that is, after all, in the line of presidential succession), all came to nothing. Thanks to some primal twitch in the Trump amygdala, Tillerson was found to have gone too far, to have run afoul of The Donald. Never mind how. It started with the usual manifestations of TES: not outright, scenery-chewing outrage but a smoldering resentment from the president* couched in passive-aggressive Trump tweets, as well as persistent leaks to the press from “Trump administration officials” about how close to Tillerson’s head the sword of Damocles was positioned. Reports of Tillerson’s pending ouster circulated as early as three months before his departure. Not for long. Early March 13, as Tillerson returned from a trip to north Africa, he found out he'd been dumped, from Kelly, who (according to different sources) dropped the guillotine blade on Tillerson over the phone while the secretary of state was in the can. And it may be about to be Coats’ turn. It’d be especially galling if it’s true, since Coats has been a loyal Trump operative from the beginning. Coats may be dismissed for doing nothing more or less than acting as a symbol of order in a house known for disorder. 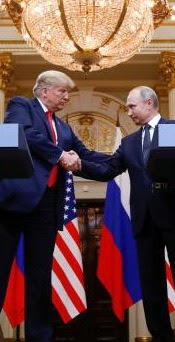 It started, of course, when Coats took umbrage with Trump’s actions in Helsinki, as the president stood next to Russian President Vladimir Putin and basically pledged allegiance to the dictator. 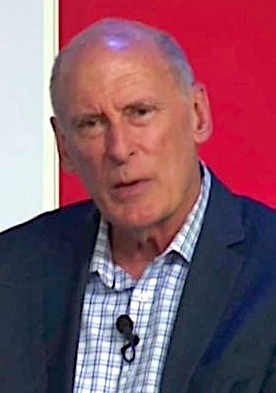 “We have been clear in our assessments of Russian meddling in the 2016 election and their ongoing, pervasive efforts to undermine our democracy, and we will continue to provide unvarnished and objective intelligence in support of our national security,” Coats wrote in a statement that managed to elude the green eyeshades of the Spin Police in the West Wing. THE MOST recent source of Coats’ trouble is his appearance July 19 at the Aspen Security Forum. Interviewed by NBC News’ Andrea Mitchell, Coats was diplomatic and circumspect when asked questions about Trump’s recent upheavals on the world stage, most recently Trump’s breathtakingly inept performance in Helsinki. Then Mitchell announced some breaking news there on the stage with Coats: According to a tweet by Sarah Huckabee Sanders, Putin has been invited to come to the White House in the fall. A perfectly normal professional’s reaction to finding out your boss has blindsided you in ways that should never have happened. No big deal. I’ll sort it out when I get back to the office on Monday. Only Coats’ boss, the president*, didn’t see it like that. Neither did the tailors and haberdashers attending the wannabe emperor’s new clothes. By late Thursday and into early Friday, news circulated that White House officials were “furious” over Coats’ off-the-cuff statements in Aspen. 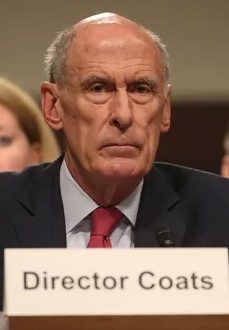 The word went out that Coats had “gone rogue,” making the director of the nation’s 17 intelligence agencies sound like a bull elk in heat. Whether those folks engage in their own predictable behavior depends, apparently, on how likely Trump is to act predictably himself. To be clear: Predictability has its place; in an environment defined by chaos, anything that’s foreseeable is pretty damn refreshing all by itself. But Trump Enragement Syndrome is an acute condition — in the short-term, at least, a (politically) terminal disease for everyone but the host. Priebus, Tillerson and others will tell you: Just because something’s predictable doesn’t make it preventable. Image credits: Coats top: Getty Images. Priebus: Aude Guerrucci/Pool/Getty Images via Politico. Tillerson: Alex Wong/Getty Images. Coats lower: Aspen Security Forum via The Associated Press. Trump: Evan Vucci/Associated Press. AMONG THE hundreds or thousands of drawings, paintings, sketches and Photoshop illustrations of the man who would be president, Donald Trump, created since he took custody of the Oval Office, there’s one that’s especially memorable. 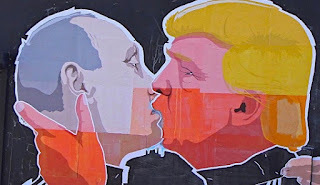 It’s an image of the president* in a deep and passionate liplock with Vladimir Putin, the maximum leader of the Russian Federation. I first saw it in a mural on a building on Yucca Street in Hollywood, about a year ago, as the relationship between the two was just starting to come to light. It turned up on the side of a barbecue restaurant in Vilnius, the Lithuanian capital, back in May 2016. There have been any number of sightings since then. But it almost doesn’t matter how far back it originates. Monday’s events in Helsinki have revealed just how prescient that artist really was. In a summit that wasn’t so much a summit as a prom date for autocrats, Trump on Monday effectively renounced the country he presumably leads and accepted the denials of a foreign power over the proven findings of his own intelligence community, in the matter of Russian interference in the 2016 U.S. presidential election. 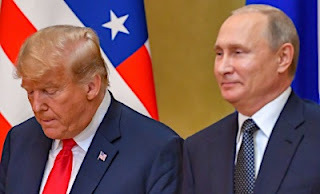 The American president* shocked the world and his own nation when he stood next to Putin and took the word of a dictator over his own countrymen. At a joint news conference after the leaders’ 131-minute closed-door meeting, Trump was asked if he believed his own intelligence agencies or the Russian president when it came to the allegations of meddling in the elections. TO AN administration for which the words “a new low” are an embodiment of the aspirational, the actions and statements by Trump are, or will be, deeply problematic for people at many levels and stations: for House Trump, whose inmates are desperately hoping to right the ship of state; for a dispirited U.S. intelligence community, now thrown under the bus by the man supposedly driving it; for our global neighbors in NATO, rightly concerned as to WTF is going on with the United States and just as rightly terrified of how it might affect them and the 70-year alliance; and for the American people, less and less sure of what it means to be an American in the face of a president* who apparently couldn’t care less about being an American. “The President must appreciate that Russia is not our ally. There is no moral equivalence between the United States and Russia, which remains hostile to our most basic values and ideals,” Ryan said in the statement. 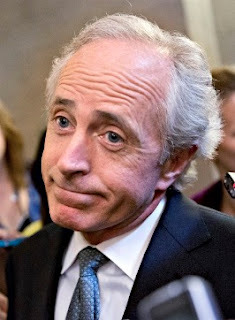 Senate Foreign Relations Committee Chairman Bob Corker said Trump's comments “made us look like a pushover.” And John Brennan, CIA director under President Obama and a career intelligence officer, called Trump's comments “nothing short of treasonous.” And more. You knew something was afoot early; Trump looked off his feed before the press conference even started. You won’t see it in most of the still photographs, nearly all of which were focused on both men standing at their respective podiums. 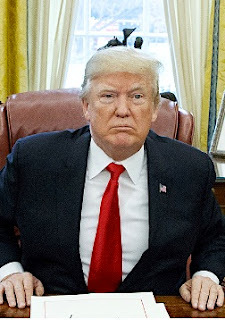 But in other images and videos of the two men as they walked up before the media, Trump — shoulders slumped, frowning more deeply than usual — looked defeated, whipped, bearing the expression of a man on his way to either get bad news himself or give bad news to someone else. Or is that the look of a man who knows he's utterly, privately co-opted? Speculation has been around for months: Maybe Putin's Got Something on The Donald. Maybe Trump was just personally reminded of what that leverage is. Whatever. Every picture tells a story. Look at the smirk on the face of Vladimir the Impaler. He may not have a musical bone in his body, but turns out the veteran Russian spymaster plays the American violin pretty well. THERE’S BEEN plenty of damage to go around. The injury done to Trump and his biography (assuming that the pedigree of his biography can fall any further) is bad enough. Trump’s performance also has a deleterious impact on the American presidency, its role as a foundational leg of the triad of our governmental system, its power as an inspirational force for positive change. And whether they admit it or not, Trump’s antics — not just in Helsinki but also in the runup to the event — are having a corrosive effect on those in his inner circle. When Trump threw America’s 17 intelligence agencies under the bus on Monday, it also called into question just how much more of this crap can be tolerated by (among others) White House Chief of Staff John Kelly, Secretary of State Mike Pompeo, and Director of National Intelligence Dan Coats, who took the unusual step of breaking with Trump by issuing a statement effectively refuting the comments of his boss. What’s their threshold for self-respect? Have they got any? Have they got any left? But in an election year like this one, the party most grievously damaged in the short one is the party Donald Trump claims to represent. The Republican Party — heir to the triumphs of Ronald Reagan, still the party’s patron saint — faces a reckoning of its identity. The aspect of the Republican brand that hews to the trappings and stagecraft of patriotism, an unalloyed and unstinting defense of the United States and its institutions has been damaged in recent weeks, and certainly since Monday. There’s no walking this back. No do-overs. Not while Trump inhabits the Oval Office. The GOP has vacated that high ground, and the party may never get it back. The Republican Party doesn't stand for what it used to stand for, and that has to be a problem. The GOP can no longer invoke its customary nationalistic platitudes as a shibboleth, a political club to be brandished against the opposition. Those longstanding imagistic Republican benchmarks, those weaponized conservative optics, are no longer valid. They’re null and void. Donald Trump has damaged this core, existential component of Republican identity, the conflation of the fortunes of the party and the nation. And the Republicans have no one to blame but themselves. And Donald Trump. 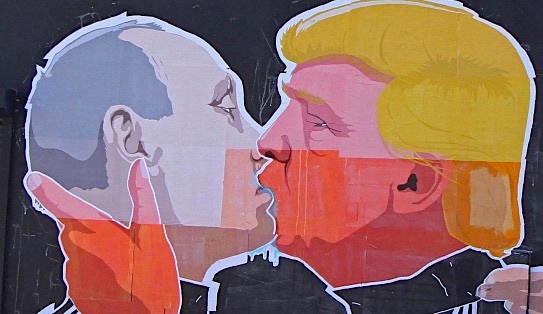 Image credits: Putin-Trump kiss: numerous sources. Trump-Putin at Helsinki: Kevin Lamarque/Reuters. Traitor in chief protest: via Sky News. Corker: Talking Points Memo. Trump-Putin at Helsinki lower: via The Weekly Standard. Kelly: Brendan Smialowski/AFP/Getty Images. 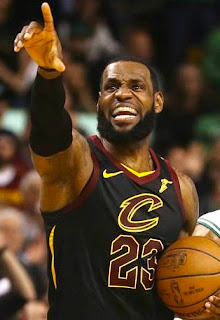 THE BIGGEST unsecret in the history of professional sports was officially revealed on Sunday: On the first day of NBA free agency, LeBron James opted out of his contract with the Cleveland Cavaliers, in order to join the Los Angeles Lakers, which everyone on this planet and worlds beyond our own knew was coming. Fans of professional basketball had been milking the drama hard for all it was worth. Sports columnists tried to pretend King James was going somewhere else. It’s as if they hoped to preserve the delicious unknowing — the start of the third act, when everything hangs in the balance — even after such cheap drama exhausted itself in a losing footrace with the facts. And the facts were obvious. It wasn’t the money; King James could write God a check for walking around money right now. It wasn’t even necessarily the chance to win a fourth ring of the lords, the necessary hardware for any serious comparison to the inevitable Michael Jordan Benchmark. 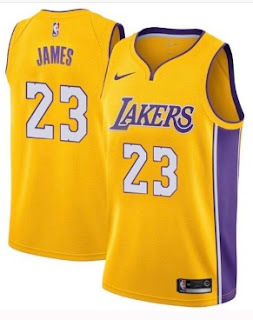 LeBron James is really coming to the Lakers for one reason: It’s the opportunity to place a capstone on a stellar career in the one American city whose outsized mythology is a match for his own. And no other city can do it. Not New York. Not Boston. Oklahoma City? Please. Houston? Yeah right. Another sojourn in Miami? Nope, been there, done that. For King James, closing his career with the Lakers completes a personal coast-to-coast resumé of winning work at teams across the country, from Miami to Cleveland to Los Angeles. He could have played anywhere, but it was the siren song of La La Land that beckoned him. Well, mostly. It was also the siren song of Magic Johnson, the Lakers head of basketball operations who charmed James with a personal touch — and a personal Saturday visit to James’ palatial digs in Brentwood. The result: By Sunday evening, at the end of the first full day of the free-agency season, the marquee attraction was already off the table. LeBron James was a Laker, with a four-year deal worth $154 million. Safe bet: Next season, Staples Center will be at capacity, 19,067 asses in 19,067 seats. Jack’s too. Tributes came in thick and fast, of course, via the Twitter quick-twitch response. Lonzo Ball, the Lakers’ promising point guard, didn’t waste any time acknowledging the new sheriff in town. “Y’a ll thought he was gonna pass up the greatest city in the world ... #TheKingIsHere,” Ball tweeted on Sunday. Ball’s tweet, diplomatically timed to The Announcement itself, made sense for other reasons. 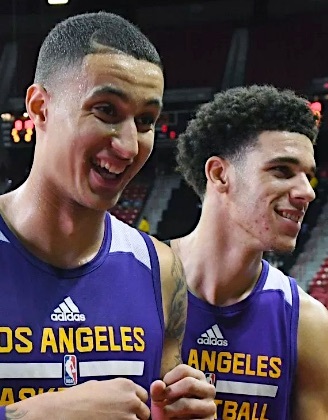 Ball and fellow Laker Kyle Kuzma have been recently engaged in a social media dissfest that’s gotten personal. Almost too personal for the front office. BALL’S performance on the court has been mixed but in a generally positive way. Last year his shooting was inconsistent, but he was a force in rebounds and assists. Being sidelined for a strain in his median cruciate ligament didn’t help. Since then, his on-court performance has improved — somewhat: A look at Ball’s rookie season stats show, well, room for improvement, which is to be expected from a rookie. So to the extent that Lonzo is serious about his career with the Lakers, his congratulatory tweet was a way of telling King James, without actually saying it: “All due propers, LeBron, I’m down for the program.” It was also a way of proving Lonzo understands that, with the arrival of LeBron (and his ravenous work ethic), school is about to be in session, and Lonzo damn well better not cut class. The other Ball — the unspoken LaVar Ball, Lonzo’s father and the brains behind Big Baller Brand athletic apparel — may be a thornier issue. The outspoken father, who’s been praising his son and his company to the skies, may be the X factor in Lonzo’s future with the Lakers, and how smoothly that future unfolds next season. 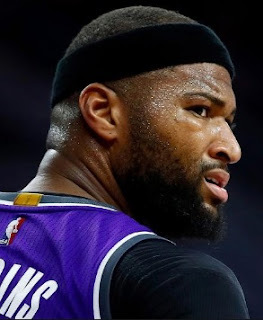 Brad Botkin at CBS Sports wrote about how, despite the hoopla and celebration, and the obvious shift in the NBA balance of power, the Lakers may have left a lot on the table — by overlooking or ignoring the free agency of the electrifyingly dominant DeMarcus (Boogie) Cousins, just snapped up by ... the Golden State Warriors. “In the end, the real winner here is Cousins, who can take his time getting back to full strength on a team that doesn't need him in any way. Seriously, they don't need him. Potentially one of the best players in the league is a luxury. And a very cheap one. If he makes it back to something near full strength, the Warriors are going to be the greatest basketball team ever assembled, bar none. Discussion over. Rest assured, the Lakers aren’t laughing. You don’t beef up the marquee like this for nothing. Before James was signed, Johnson had already said he’d quit his Lakers job if he couldn’t attract a major world-rattling talent. Johnson, the team and the city knew what was at stake. WITH MAYOR Eric Garcetti making exploratory presidential noises, and the 2024 Olympic Games in the wings, Los Angeles is set to cash in on a fulfilled pop-cultural manifest destiny, and that includes sports, and at least a shot at attaining the lofty perches of the past, when Showtime was in session and Jack showed up pretty much all the time and ... and everything was just better. We’re almost fated to a “High Noon”-style face-off between the Lakers and the Warriors, maybe as soon as next season. The early betting line is that the Warriors will almost certainly re-repeat as champions. But you don’t play the game on paper. You play it in the streets and alleys, you play it in the gyms and driveways. You play it in the cities. And no other city in America transmits the shock of the new like LA does, and the Lakers know that. And LeBron James knows it too.